Coal-fired power plants spew harmful pollutants like sulfur dioxide, soot, mercury, and lead into the air. After coal is burned, coal ash often ends up in our air and water. This ash – which contains arsenic, selenium, thallium, mercury, and other toxic substances – can cause serious bodily harm, including inflammation of the lungs and serious damage to the brain, heart, liver, kidneys, and stomach. If coal ash is released into local waterways, it can leach into underground reservoirs of drinking water, increasing the risk for cancer and neurological damage in the humans and animals who consume it. Natural gas produces less carbon dioxide than coal, but natural gas wells are also a major sources of methane leaks. Methane is a greenhouse gas with a warming potential 34 times greater than that of carbon dioxide over a 100-year period. And fracking – a process used to extract natural gas from hard-to-reach shale rock – can negatively impact aquatic habitats and lead to water pollution. Unlike traditional sources of energy like coal and natural gas, solar energy doesn’t produce any greenhouse gas emissions. And even when you consider the energy needed to produce the solar panels, the solar industry has prevented more greenhouse gas emissions than it has produced. Solar power is abundant and unlimited, and shines on homes and businesses alike. Billionaire entrepreneur Elon Musk has suggested that solar power could easily provide all of America’s energy needs. All that would be needed is a large solar array of about 100 square miles in a sunny area like Utah or Nevada. In fact, the entire world’s energy needs could be met by covering just 4 percent of the world’s desert areas with solar panels. A home equipped with a solar power system and a battery storage system could achieve total energy independence from the grid. A system of this type would be a big investment, but it would also zero out your energy bill for decades to come. If you’re serious about energy independence, contact PowerScout today. We can connect you with multiple high quality local solar installers who will compete for your business. When installers compete, you get a great deal. Our team has collectively overseen the installation of 1.5 GW of solar capacity – enough to power 250,000 homes. Installers in our network will be able to evaluate your home and determine how much you could save by switching over to a solar energy system. They’ll also be able to match your system with a an appropriately sized battery. Installing your battery at the same time as your solar energy system costs about $3,000 to $5,000 less than getting your battery installed at a later date. Assuming your home receives an average amount of sunlight and you install a 3-kilowatt system, you could cut your energy bill in half. Over the average 25-year lifetime of your solar system, this translates to tens of thousands of dollars in electricity savings. A 2011 study found that in a span of just 20 years, the average home solar customer would save $20,000. But savings vary significantly depending on where you live; a California resident could save over $34,000, but a household in Hawaii – where electricity rates are the highest in the nation – could save almost $65,000. Other clean energy options are noisy. Wind turbines, for instance, are notoriously irritating to live near. Even if a wind turbine is 300 meters from a home, the turbine will produce sound at 43 decibels. The average air conditioner typically runs at about 50 decibels, while the typical refrigerator produces about 40 decibels. Only solar panels are completely silent once they’re installed and producing energy. Solar panels don’t have any moving parts, so there is no wear and tear to worry about. While solar panel performance can be affected by dust accumulation, the occasional rain shower keeps them plenty clean. The only other maintenance you might need to do is cleaning snow or leaves off them in the winter and fall. If your solar system contains central (string) inverters, they’ll need to be replaced after 12 to 15 years. Other than that, your solar panels are a no-hassle power generating system. Solar panels are built to withstand the elements and last a long time. Most solar panels are under warranty for 25 years. Even the inverter, mentioned above, usually has a warranty of 10 to 15 years that covers you when it finally needs to be replaced. Early solar panels weren’t much to look at. However, with advances in technology, the most modern panels come in a smart, streamlined blue or black(depending on whether they’re produced using polycrystalline or monocrystalline solar cells). The black frames and black back sheets make them an attractive addition to your roof. Tesla recently announced a series of solar tiles that look no different than regular roof shingles, but function in the same way solar panels do. These shingles are only available in two shades of gray now, but will be available next year in tuscan (a light brown) and slate (a mosaic of earth-toned tiles). If aesthetics are a concern for you, your solar installer should be able to work with you to identify locations where your panels will be inconspicuous while still producing their maximum amount of energy. For example, you might be able to install solar panels around the back of your roof or in your backyard. Whether you lease or buy, you can get your solar installation started with little to no money down. Leases often allow you to have solar installed for nothing down, though you’ll be locked into a contract for a fixed period (typically 15 months, at least). If you prefer to buy your solar panels, zero-down plans offered directly from the solar company allow you to slowly pay off the cost of your solar panels over time at a lower rate than what you’d pay for your monthly electrical bill. A growing number of private banks are also starting to offer home solar loans. Click here for more information about solar loans. In addition, solar power customers will get lots of federal, state, and local government support in the form of tax credits and other incentives. The federal government, for instance, provides a 30% income tax credit, effectively reducing the cost of your system to 70% of its total price. In addition, many state and local governments offer rebates, tax incentives, and solar generation credits to make the economics even better. A recent study from Lawrence Berkeley National Laboratory showed that solar panels can increase your home’s property value. After analyzing the sale prices of 22,000 homes across the country, the researchers found that a standard solar system will increase the price of your home by about $15,000. Another LBNL study conducted between 2010 and 2013 found that even in the case of solar leases, 77 percent of leases were transferred to the new property owners upon the sale of the home. Solar panels are typically installed by the seller, who takes care of permitting and paperwork, determines the ideal position for your panels, and connects them to the grid and/or your home storage battery. If you choose to take the DIY route and install anything incorrectly, you could end up with sub-optimal energy production. Other problems might require you to engage in an extended troubleshooting process in order to solve the issue. Having your system set up by a certified solar professional will help you avoid complications and ensure that everything is connected properly. Finally, installers often have access to equipment and materials that the general public does not, since wholesalers and distributors often won’t offer all their equipment for sale to the general public. While leaving installation to the professionals will cost more than installing the panels yourself, it’s definitely the best option, since it saves you significant time and effort. One of the most notable of the solar power pros and cons is that solar panels don’t produce power when the sun is down, and they offer only variable performance when it’s cloudy. Intermittency isn’t a problem when the solar system is connected to the grid or a battery, since any shortfall in production is bridged by electricity from the backup source. To produce solar power, the panels need to be installed on land or a roof that is exposed to adequate sunshine and generally free of shade. The number of panels－and the corresponding roof or land area－you’ll need depends on the energy requirements of your home. Based on a solar panel efficiency of about 15 percent, you’ll require at least 1 square foot of roof space to produce 15 watts of solar power. Most residential solar installations hover around 5 kilowatts (5,000 watts). To achieve this wattage, you’d require just over 333 square feet of space. Since the average U.S. roof is about 2,700 square feet, most homes should have plenty of space, but because of these spatial requirements, some homeowners won’t be able to enjoy the benefits of solar power. If you need to store the electricity that is produced by the solar panels, it may add significant costs to your project. While battery storage costs are coming down, they typically still add about $6,000 for equipment and hardware, plus another $2,000 for installation fees. And, as mentioned above, installing a battery after you’ve already installed your solar system will cost around $4,000 more than it would to install it at the same time you install your panels. Fortunately, you probably won’t need a storage system unless you don’t have access to a grid connection, suffer from poor grid reliability, or have expensive grid usage charges. If you have poor credit, it can be tough to get a loan. Solar loans from installers and lending institutions alike often require a credit score of at least 500. But solar loans offered from your installer aren’t the only option. 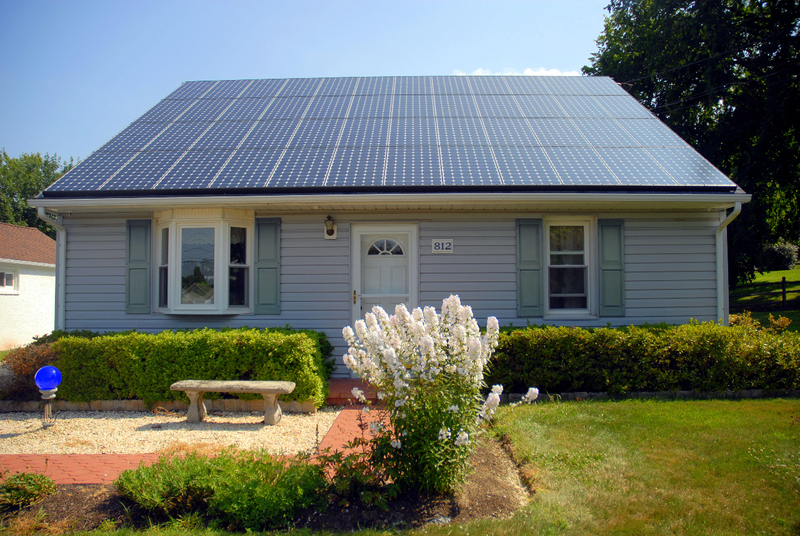 Property-assessed clean energy (PACE) financing options can help you finance your solar system. Unlike traditional loans, PACE loans are based on the value of your home, not on your credit score. While interest rates tend to be higher than those of traditional loans, PACE loans have allowed thousands of homeowners with low credit to go solar. PACE financing isn’t available everywhere, unfortunately. Check this map for information about whether your state has authorized a PACE program. Whether you buy or lease, installing solar panels typically requires home ownership. However, a new form of solar called community solar (sometimes called “shared solar”) is starting to expand access to solar power to renters. In a community solar arrangement, solar projects are installed in common locations and community members (either homeowners or renter) can purchase their electricity from this solar mini-grid. Through community solar setups, neighborhoods and communities can enjoy the benefits of clean, affordable solar energy. One of the downsides of rooftop solar is that it is hard to take it with you if you move. While one can always find an installer willing to remove the solar panels and install them somewhere else, your new home may not be suitable for solar or may require a different system configuration. However, it has become increasingly easy for solar customers to transfer the loan or lease to the new home owner. If you’ve purchased your solar panels outright, you might be better off just leaving them attached, thus increasing your home’s sale price. Thanks to PowerScout for the deep dive into the pros and cons of solar. Want to compare multiple quotes for all your smart home improvement projects like home solar? Hop over to PowerScout and say hello.